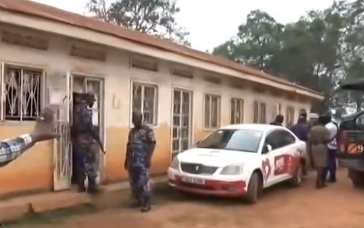 WAKISO– Officials from the office of the Attorney General and the newly launched anti-corruption Unit headed by Lt. Col. Edith Nakalema have stormed the Ministry of Lands zonal office in Wakiso following an allegation of corruption and land scams. This after several residents in the past months claimed the district offices have been inaccessible. The joint security and anti-corruption unit team have since detained some according to reports. According to the new anti-corruption unit, the way the Wakiso lands zonal office conducts its duties attracted the attention of State House. “Our team led by Lt. Col. Edith Nakalema currently at Wakiso Lands Office to make a follow up on issues raised by the citizens. For close to a month, the office has been allegedly inaccessible by the citizens,” the anti-corruption unit stated on Twitter. The unit claims that officials have been conniving with private ‘powerful’ individuals to declare revenue causing losses to the government. Lt. Col Nakalema quizzed lands offices on why their offices remain closed on a working day while they are inside comfortably sitting as people queue for long for services.